Most of my blogsot user friends ran way towards wordpress because of good templates and many more features but now blogger also have started improving their services and i am happy for that . Few days back i shifted towards beta blogger and changed my template in new design . 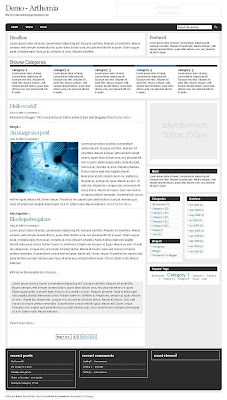 Now here are two new magazine style blogger templates for my friends those can be used in blogger also . These template are converted from wp designs and i hope you will like them . First of all thanks to Michael who designed those beautiful template and i got inspired from them . We have done our best to convert arthemia. but not all perfect because blogger don't have many plugin/widget as wordpress . If you face any problem while installation or modification than you can read all instruction here . How to install blogger template . Still you need help than you can post your question in comment box and we will sure help you out . Maybe soon i will offer you few more good blogger templates designs .